I recently reviewed Module 4 of Tom Heaton’s ongoing updates to his Encyclopedia of Marx Action Figures, but it occurs to me that, aside from a brief mention in a PopCulteer in 2009, I’ve never recommended his original book. Today in the 2017 PopCult Gift Guide we remedy that by suggesting the perfect gift for any fan of Johnny West and Marx Action figures, Tom Heaton’s ongoing series of comprensive books that cover the hobby from top to bottom. Back in 1999 Tom Heaton wrote a the definitive book on Marx action figures, but he realized that it wasn’t quite complete. Due to the necessities of achieving a manageable page count for his publisher, he had to reign in the details and the scope of the book. So he continues to update his original Encyclopedia of Marx Action Figures with expansion modules. His Vintage Toy Room site also offers some great vintage items on sale, and has loads of information on the history of Johnny West. One of the most refreshing things about Tom’s books is that, unlike a lot of authors who cover collectible toys, he doesn’t pretend to have all the answers. He freely admits that he’s still learning about the toys. Tom explained that there was still much to learn when he wrote his first book and new sources of information (and new variants of toys) were turning up all the time. Because of ongoing discoveries and the size limitations of his original book, Tom began self-publishing update modules that would focus on one particular type or era of Marx Action Figures, and present in-depth looks at the figures, accessories, packaging, advertising and known variations that exist. His latest module includes revelations about the action figures that just came to light earlier this year. This approach works perfectly with Marx action figures, because, with the toys originally being produced in this country, there are all sorts of bizarre variants and oddball figures floating around out there, not to mention an entire universe of Marx figures produced in other countries. Louis Marx encouraged his employees to take home examples of the toys he made to see what their kids thought of them, and sometimes they’d take stuff that was made in strange colors or styles that never made it into production. There are times when it seems like there’s some new major discovery every week or two. We may never know the full story of Johnny West toys. That’s part of why this hobby is still thriving. The recent influx of quality reproductions, made from the original molds that are now in Mexico, is actually reviving interest in Johnny West, bringing tons of new collectors into the hobby more than four decades after the Best of the West gang originally rode off into the sunset. With American Pickers recently visiting the now-closed Marx Toy Museum in Moundsville, interest in all things Marx is higher than ever. If you have a Johnny West collector on your holiday shopping list, they need these books. Even if they have the original Encyclopedia, the modules are essential to any die-hard Marx Action Figure collector. 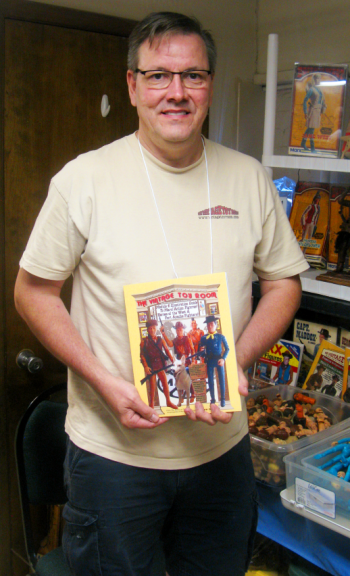 After the Encyclopedia, the recently-published Module 4 (seen left, held by the author last June in Wheeling) is a great primer on the early days of the line, covering the Western action figures made by the Marx Toy Company from 1964 to 1976. It covers the key introductions and changes that happened in the first three years of this classic action figure line. Module 1 covered rare prototypes, store displays, box art variations and more, with a focus on the Johnny West Adventure Series, from 1976. Module 2 offered in-depth coverage of the 1974 Best of the West line, including the introduction of Princess Wildflower. Module 3 opened up the world of Canadian Marx Action figures with details on Dangerous Dan, Sheriff Goode, Jimmy West and other figures that we didn’t encounter South of the border. Each module features large, full-color photographs of the figures, both as bare figures and decked out with all their gear, along with descriptions of everything included in the package and photos of all the accessories. This makes identifiying figures a snap. And there are full details on the horses. Thunderbolt, Comanche, Thundercolt, the Pancho Pony, plus all the wagons, buckboards, corrals and ranches that were sold for Johnny West. You’ll even find info about Johnny’s dogs and the elusive buffalo in these pages. The original Marx Action Figure Encyclopedia and all the modules can be ordered directly from Tom’s website, The Vintage Toy Room. Tom will even sign and personalize these for you, if you wish. Tom has already completed most of the work on Module 5, which will be published next year and which will focus on Stony Smith, The All American Fighters and the Marx Military Action Figures. These are low-print-run, full-color books, crammed with vital information for the hobby, and are worth every penny. You can build an instant library of Marx Action Figure knowledge for your giftee, all in one fell swoop.